The R class, shown, lost sales because of its station wagon-style look. 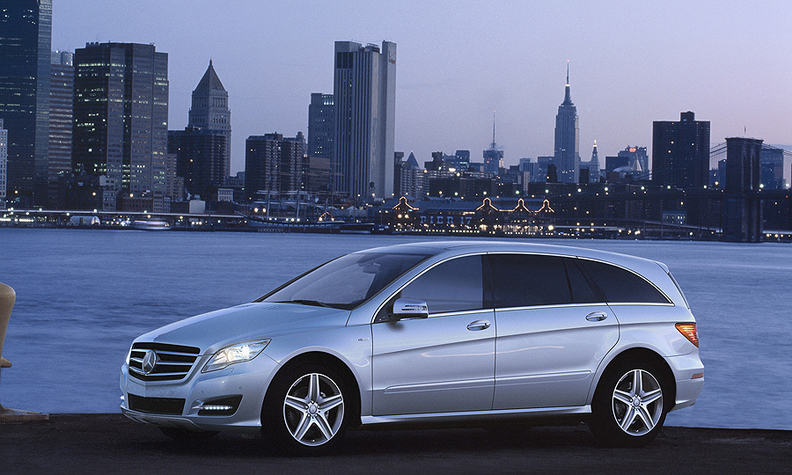 Mercedes-Benz is thinking about bringing the R class back to international markets, according to a report. The R class was available from 2006 until 2013, when it was withdrawn from almost every international market due to slow sales. But it remains in production for China, where it continues to be popular. Mercedes is transferring output of the R class from its plant in Tuscaloosa, Alabama, to AM General, which will build it under contract starting this summer at a factory near South Bend, Indiana. The resurgence of interest in luxury SUVs and crossovers following a brief lull is the reason Mercedes is giving the R class, which mixes the attributes and styling of multi-purpose vehicles, minivans and SUVs, another look. Wolf-Dieter Kurz, Mercedes-Benz vice president of product group SUVs and sports cars, told caradvice.com the company is interested in expanding its SUV and crossover lineup further, following the debut of the GLE Coupe and redesigns of the GLE-class and GLC-class models. "Basically I think I feel that the SUV segment -- due to its growth, and the worldwide interest that the SUVs have -- the SUV segment will be also in future the one which sees most derivatives, let’s say, in the outskirts of the portfolio," Kurz told caradvice.com. "Because it’s getting kind of fuzzy in its outskirts, let’s say." In an interview with Automotive News this week, Kurz said there are no plans to reintroduce the current R class in the U.S. He said American consumers were initially confused with the R class and later decided it was too similar to a station wagon, a segment that has struggled in recent decades in the U.S. The R class has continued to be a solid seller in China, a market predisposed toward luxury minivans -- Buick sells two large luxury vans there. But the R class was not a major sales success in the U.S. despite the variety of models offered, including an AMG variant, and was withdrawn in 2013 after a 2010 facelift failed to maintain sufficient consumer attention. Kurz says Mercedes is still interested in roomy touring crossovers. "There was already one that we had in the portfolio -- maybe we were too early -- which was the R class, which we are still selling in China. It’s doing good, with 12,000 to 14,000 units per year," Kurz said. The departure of the R class from the company's lineup left a hole in terms of size and utility, with only the GLE and the GLS offering similar amounts of room, though in a distinctly SUV wrapper. The seemingly unrestrained proliferation of crossover models from Germany's luxury automakers seems to have ignored roomier minivans, though the new Mercedes-Benz Metris, which will arrive in a matter of months, will offer van buyers an all-new option. Diana T. Kurylko of Automotive News contributed to this report.